As the bookkeeper for her aunt, Katharine Tulman is sent to investigate claims that her uncle, the current proprietor of the family’s estate, is wasting its assets and belongs in an asylum. Upon her arrival at Stranwyne Keep, Katharine is astonished to find an entire village populated by people would otherwise be toiling under horrid conditions in London’s workhouses. Instead, they have jobs on the estate, which has its own manufacturing facilities, all designed by Katharine’s brilliant uncle. Although her conscience tells her not to send her uncle, and, consequently, his employees, away, Katharine also worries what will become of her if the cousin on whose generosity she will one day depend does not come into his inheritance. Faced with a difficult decision, Katharine considers all of the consequences while trying to uncover what else Stranwyne is hiding. 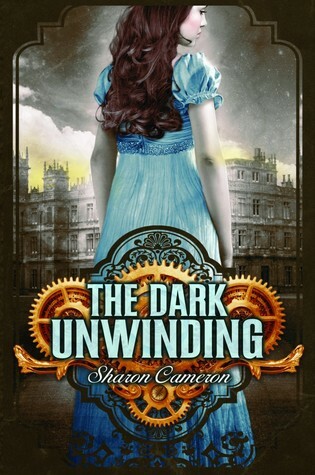 The Dark Unwinding was quite a surprise. It’s one of those novels whose genre is a bit hard to categorize. There’s a Victorian setting and a smidgen of steampunk. At first I’d also expected a paranormal element to show up because there were some very eerie goings-on at Stranwyne Keep, where seventeen-year-old Katharine Tulman is sent by her aunt to find out if the rumors that Katharine’s uncle is mad and draining all of the family’s funds are true. It turned out that there was no supernatural anything involved here, just some really good transitions to a darker tone to make you think that something creepy was happening. What you do have is a moving story about a young woman who ultimately holds the fate of her uncle and several hundred other people in her hands. Katharine lives under the guardianship of her aunt, Alice, and keeps her books for her. Aunt Alice has received alarming reports that her son’s inheritance is in danger, and, not one to do her own dirty work, dispatches Katharine to find out the truth. Katharine is not prepared to discover that the family estate is home to a whole community of workers who’ve left behind the wretched conditions of London’s workhouses. Stranwyne manufactures goods right on the premises, with the profits going back into the estate. All of its impressive facilities were designed by her uncle, Frederick, who is an engineering genius but otherwise childlike and easily upset. His workers, especially Lane, the young man who acts as a kind of caretaker to him, are fiercely protective of “Mr. Tully,” as they call him. They make their displeasure at Katharine’s intrusion immediately and abundantly clear. I thought Lane’s genuine concern for Uncle Tully was very sweet. This book carries quite an emotional weight to it; the story of how and why the operation at Stranwyne came to be was both cleverly devised and touching. Katharine was kind of a blah heroine to me. I mean, I understand that she’s entirely dependent on her aunt and, one day, her cousin, and has to look out for herself. If there’s no money left for cousin Robert, there won’t be any money for Katharine. If Aunt Alice finds out that Katharine didn’t go straight to her with what’s really going on at the estate, there won’t be any money for Katharine, either, because Aunt Alice will cut her off. Katharine is not without a conscience and she does care about what will become of her uncle and all the workers, but I wanted to see her take more initiative. She’s supposed to decide whether or not to blow the whistle after thirty days at Stranwyne, and there were times when I felt as though she was just dawdling about. Despite being a moderately sized novel, it took me a while to read this. Some parts dragged and made it seem like the end of Katharine’s thirty days wasn’t going to arrive. I also picked out the villain early on. If the pacing had been more even and Katharine a little more interesting, this novel would have been more than a slightly above average read. The sections of The Dark Unwinding that were interesting were really good, but the not-so-interesting parts were a bit of a chore to get through. The book does have a strong emotional pull, though, and anyone who’s a fan of Victorian-set fiction might want to check this out. I didn't like this as much either. Some parts were a drag and I wish the steampunk element was more. I think it took me almost 2 weeks to read this, and it's not that many pages. I thought that the steampunk was going to be a larger part of the story and was a little let down that it wasn't. I liked the setting and I think it does have difficulty setting on a tone..I think it one of those where the sequel will be better than the set up book! Yeah, I felt like the book was trying to decide whether it was trying to be historical fiction, Gothic, or steampunk. I liked the story itself, though, and am curious to see where it goes in the sequel. I can't say that I've read a lot of Victorian setting books, but they do intrigue me. It sounds interesting how you mention that it seems like a paranormal aspect is coming because of a creep factor, but it's really just suspense. I do get bummed when I figure things out though. I enjoy it when I am surprised. What a great review! Jaclyn @ JC's Book Haven. The suspense in this novel is quite well done. I thought something supernatural was going on, but it wasn't. I like being surprised, too, and the baddie was just too obvious here. Sorry it failed to hook, I might give this one a miss. Nice review! Sometimes a book just doesn't quite reel me in completely, and that was the case here. I liked some parts, but others weren't all that compelling. The title, cover, and blurb led me to think that something supernatural was going on, and once I got reading, so did the story. That there wasn't came as a big surprise to me. Hmmm, see based on the cover I thought this was going to be a book with a least a slight fantasy element to it, maybe YA steampunk urban-fantasy or something...I'm still curious about the whole plot though! I do enjoy Victorian settings and the mystery part of it seems like it could be compelling. I'm sorry that it dragged a bit for you but I'll be keeping this one in mind- awesome review as usual!! It does have an eerie feel to it at times, and I was curious about what was really going on at the estate. Katharine's character fell on the flat side for me, though, and I had to push myself through some of the slower-paced bits.